Multiplication is repeated addition. Division is the inverse operation (opposite action) of multiplication, so -- division is repeated subtraction. If 4 of us share the cost of a $12 pizza, we each pay $3 because 4 × 3 = 12, therefore 12 ÷ 4 = 3. This means we could separate $12 into 4 "equal packets" of $3 each. 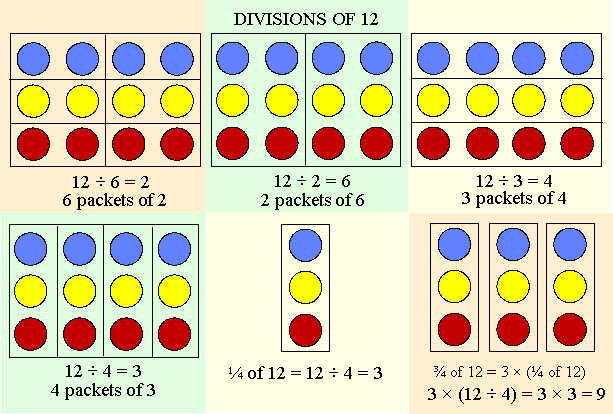 But since division is the inverse operation of multiplication, and repeated subtraction could become extremely time consuming once the numbers are big -- we use the multiplication tables, combined with our knowledge of factors and estimating, to help us divide numbers efficiently. Fractions mean division. When we take ½ of anything, we divide it by 2. When we find ¼, we divide by 4. And, since ¾ is the same as 3 × ¼ , when we take ¾ of something, we divide it by 4 and multiply it by 3. Since math is a language, we have to pay special attention to the words we use to name the different numbers and symbols in our work. We use 3 terms -- multiplier, multiplicand and product -- to name the parts of a multiplication expression. We use 4 terms to name the parts of a division expression. The dividend is the number to be divided. If the division is presented as a fraction, it is the numerator. The number doing the dividing is called the divisor, or the denominator (in the fraction). The result or answer is called the quotient. At times, there is a remainder -- which, like its name says -- is left over once we subtract all the whole-number "divisor-sized packets" we can, from the dividend. When we divide an odd number by an even one, there will always be a remainder of 1, since any odd number is 1 bigger than the preceding even number. Say 3 of us want to share 7 candy bars equally. After each of us takes 2 whole candy bars, there will be one left over. That's why it's called the remainder. We each get one third of that last remaining bar, so a fair share of 7 candy bars for 3 people is 2 and a third bars each. If our pizza had cost $13 instead of $12, an equal share of the cost would be 13 ÷ 4 = 3¼ or 3.25. Once we each pay $3, there will be $1-more left to pay. So, each of us contributes another $¼ or 25¢, and the 13th dollar is paid. In the 2nd fraction above -- the one with 15 + 2 in the numerator. We rewrote or regrouped 17 as 15 + 2 because 15 = 5 × 3 -- a multiple of 5 and therefore divisible by 5 -- and since we're trying to divide by 5 -- that's a good thing!! 15 is also the greatest whole number multiple of 5 that we can subtract from 17 -- and that's what we want. When we divide 15 by 5, we get 3 -- the whole number part of the quotient. We have a remainder of 2 that needs to be divided by 5 -- so our answer is . Notice the remainder of 2 on the right side. because two-fifths of a dollar = 40¢. what to do with the remainder? There are 2 ways to deal with the remainder. Either we express the quotient as a mixed number with fraction part made up of the remainder over the divisor, or we write " R " and the remainder value next to the quotient -- shown above in the example on the right. Here is the 7 times table. It lists multiples of 7 from 7 × 1 to 7 × 9. It tells us that 14 ÷ 7 = 2, and 42 ÷ 7 = 6 and so on. If we divide any number in the 2nd row by 7 we will get a whole number quotient = to the number in the 1st row. So when we divide a multiple of 7 by 7, there will be no remainder. When we divide a number that is not a multiple of 7 by 7, there will be a remainder. When we do math questions, we must always check our work, because mathland is a perfect place where coming close is no good at all. When we do math, we aim for perfection. multiply quotient × divisor then add the remainder. 1. For single-digit divisors, divide, multiply and subtract. 2. Express remainders as fractions or with uppercase " R " and the remainder's value. 4. To check, multiply quotient by divisor, add the remainder, get the dividend. 1) Use the multiplication tables to find these quotients. 2) Find these quotients and remainders. 3) Shawna, Jennifer, Tanya and Sofia shared a taxi when they went to the museum. The meter said $12.50 and they wanted to tip the driver $1.50. What was each girl's share of the taxi fare? each girl's share of the taxi fare is $3.50.